I have an apartment in Kara, Togo, and find myself in Natitingou, Benin, and after some soul searching, I find I am hungry, I wanted to eat better food. 1. Your love life is better. 2. It is 10-50 times cheaper than Europe or the USA. 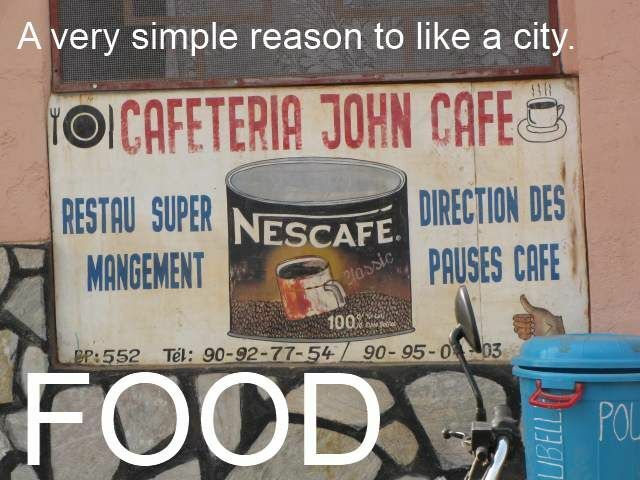 However, when choosing a location, I have become aware, love or money are not as important as food. This simple diner in Natitingou, Benin was a huge temptation to leave Kara for few weeks. I refuse to make decisions that revolve around food, but after a month or two, good food has risen on my priority list. If I share what I am eating, I may never be able to convince my chubby American friends to come visit. But, I will try show the food I eat. Generally, I must scavenger all day long to find the proper diet. When I find a food that is healthy, I eat it then, because it is not easy to find them all in the same location.